MANCHESTER: Foreign Minister Shah Mehmood Qureshi says Pakistan’s legal team will present its stance in Kulbhushan Jadhav case at International Court of Justice in The Hague on 19th of this month. The Minister said the government has effectively highlighted the issue of Kashmir in British Parliament and we want to promote Intra-Kashmir trade. He said India seems worried over the worsening situation in occupied Kashmir as young generation of Kashmiris is fed up with India policies. 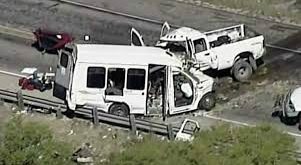 Accident kills 5 people of the same family.